BC & Alberta Guide Dogs breeds, raises and professionally trains Guide Dogs for individuals who are blind/visually-impaired, at no cost to the recipient. Our goal is to improve the quality of life for individuals living with little to no vision by providing a professionally trained guide dog. It takes up to 2 years and costs our charity up to $35,000 to produce each guide dog. Our organization relies on the generosity of donors to serve citizens of British Columbia and Alberta so that we can provide these dogs free of charge to families. Guide Dogs enable the recipient to move around safely and independently, helping blind or visually impaired people navigate their surroundings. Under the handler’s direction, dogs safely guide their partner around obstacles, through intersections, to stairs, doors and other landmarks. 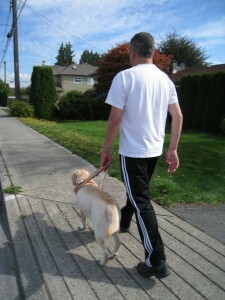 At approximately fifteen months of age, the dogs enter the Advanced Training Program, working with a Guide Dog Mobility Instructor. This advanced training is completed in approximately twenty weeks, depending on each dog’s individual needs. Once the dogs in advanced training have completed approximately 75% of their training cycle, the Training Department begins the matching process of working dog with client. For each instructor this is possibly the most complex process of all. All aspects of the dog’s abilities and needs must, at this time, be well understood. At the same time, we need to ensure that we fully understand the abilities, needs and expectations of the client. The majority of programs held are conducted on a domiciliary basis (home based training). From time to time we also hold residential courses that are based at a local hotel. Your new canine partner is delivered to your home by your class instructor. The practical class training then begins the following week and will take place over three weeks (15 days), Monday through Friday. Prior to delivering your guide dog, your instructor will have very carefully matched you to your specific dog to meet your individual needs based on your size, walking speed, home environment, and many other criteria. The purpose of the pre-class placement is for you and your new dog to bond together before the rigors of class training begin. This bonding eliminates the possibilities of your dog being distracted by your class instructor. On the day of pre-class canine placement, your instructor will spend the day with you, instructing you on how to walk your dog on a leash with sighted assistance, in-house obedience, free running (in a secure area), feeding, grooming and toiletry. Your formal training commences on the Monday, and over the next three weeks you will cover the entire spectrum of training, equipping you for success in your post-graduate period. Training includes working your dog in harness in both urban and rural areas. It also includes public transit, public buildings, shopping malls, routes with and without sidewalks, how to deal with obstacles on the sidewalks, safely crossing streets, as well as how to deal with the public and any access issues that might arise. During class, your instructor works with you on an individual basis, and has just one client at a time. On completion of the program, you will have attained a high level of competency with your guide dog and will be well-established in your use of your home routes. Each client receives a minimum of 50 hours of in-harness training during the program. During the application process, BC & Alberta Guide Dogs will work closely with you, your parents, appropriate individuals at your school, and other professionals who work with you. Also, we will develop an education program for the student body and faculty at your school, seeking their support in not feeding or distracting your new guide dog. The youth training program always takes place during the summer vacation from school. We like to begin the class as soon as school is out so that you and your guide dog will have the summer to practice and raise your level of proficiency prior to your return to school in the fall. Your new canine partner is delivered to your home by your class instructor either. The practical class training then begins the following week, and will take place over three weeks (15 days), Monday through Friday. Prior to delivering your guide dog your instructor will have very carefully matched you to your specific dog to meet your individual needs based on your size, walking speed, home environment, and many other criteria. On the day of pre-class canine placement, your instructor will spend the day with you instructing you on how to walk your dog on a leash with sighted assistance, in-house obedience, free running (in a secure area), feeding, grooming and toiletry. The purpose of the pre-class placement is for you and your new dog to bond together before the rigors of class training begin. This bonding eliminates the possibilities of your dog being distracted by your class instructor. Your formal training commences on the Monday and over the three weeks you will cover the entire spectrum of training, equipping you for success in your post graduate period. Training would include working your dog in harness in both urban and rural areas. It would also include public transit, public buildings, shopping malls, routes with and without sidewalks, how to deal with obstacles on the sidewalks, safely crossing streets, dealing with the public, and access issues. During class each instructor always works on an individual basis with one client at a time. On completion of the class you will have attained a high level of competency with your guide dog and be well established in your use of your home routes. Each client receives a minimum of 50 hours of in-harness training in class. Part of your training program will also be conducted within your school to prepare you for your return to class in the fall. During your first day of school your class instructor will be in attendance to ensure a smooth transition to the busy halls and classrooms.